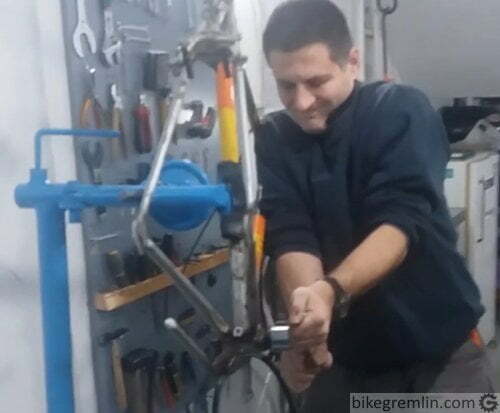 Explanation of a very important part of good quality bicycle maintenance and repairs: mounting and anti seize pastes. What exactly are they, why are they important, how are they used/applied. In the remainder of this article, I’ll use the term “mounting paste” to cover all the mounting and anti-seize pastes, noting differences where it’s needed. It is also understood that only good quality pastes are considered – cheap poor quality ones don’t have enough additives to provide good long term results (I will recommend a few good ones at the end, don’t worry 🙂 ). What are mounting and anti seize pastes? 1. What are mounting and anti seize pastes? Mounting pastes, as the name says, are pastes for mounting elements. 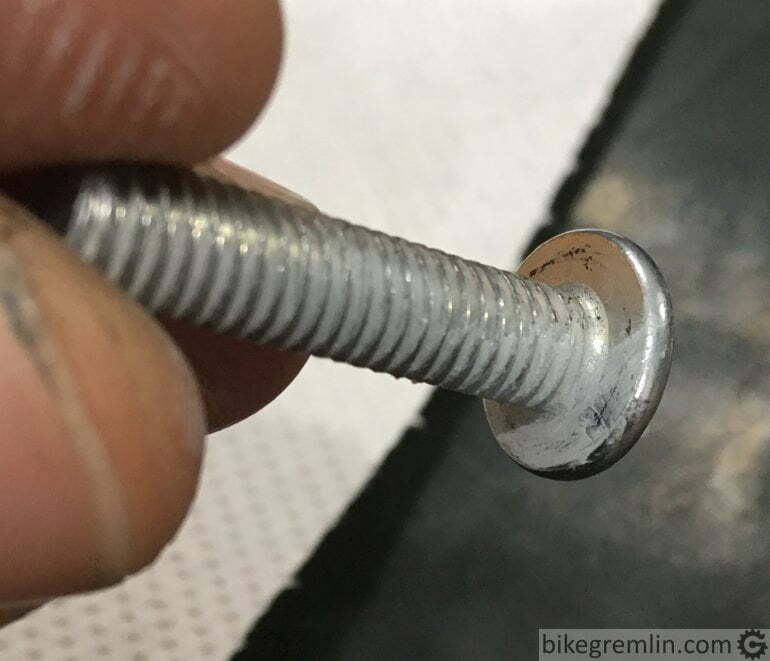 They are applied in a thin coating on bolt threads and other parts (seatposts, stems etc.) before mounting them and tightening to an appropriate torque. 2. What’s that good for? They help achieve a gradual, accurate and precise tightening torque and good parts alignment. Most mounting pastes also prevent parts from seizing due to rust and/or galvanic corrosion – which gives a long term protection and prevents and damage when dismounting, or replacing parts, making it a lot easier. 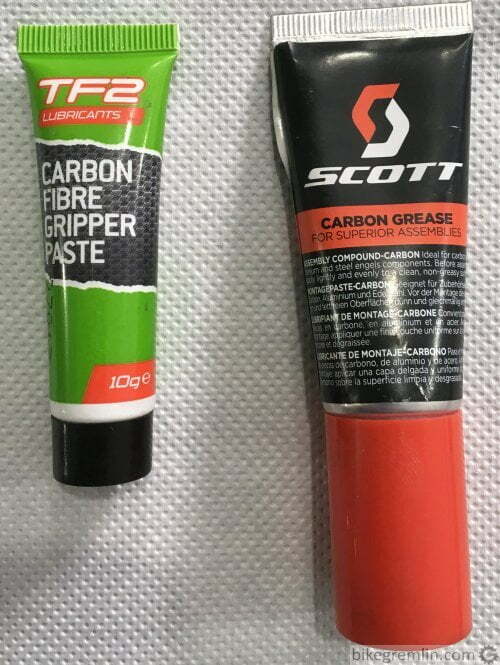 Carbon mounting paste prevents the parts from sliding relative to each other, making them stay in place even with a relatively low tightening torque (strong tightening can cause carbon bicycle parts to crack). Tightening torque causes elastic (and to a degree plastic too) deformation (lower part of picture 2 shows deformation due to force applied pushing two surfaces against each other). Imagine, under force F pressure, trying to push light-grey material over the dark-grey one, to the right for example. It will go a bit easier, until the “teeth” bite each other. Then it will go a bit harder – until it goes a little bit easier again. This happens in “micro jumps”. If you are tightening a bolt to say 5.0 N⋅m and the “teeth bite” at 4.4 N⋅m, torque wrench could click at 5.0 N⋅m torque, without the bolt moving at all from the 4.4 N⋅m position. Or, if the “bite” gets loosened at 4.9 N⋅m, you could in fact overdo the bolt due to sudden jerky movement/release of the bolt’s friction. Will talk more about torques in chapter 4. This is especially critical when mounting sensitive carbon fiber parts and with square taper cranks. Mounting paste acts as a lubricant in these situations, allowing an even tightening torque. Ordinary grease can achieve the same goal, but it doesn’t provide any long term seize properties, explained in chapter 2.2. Mounting pastes contain a relatively large concentration “micro flakes” (mostly metal oxides, kaolin – depending on paste type), meshed with some grease. Grease gets squeezed out in (a few months) time (that is why ordinary grease isn’t good for this application), but the flakes remain. Flakes are made of soft, non reactive materials. That way they prevent corrosion and, when dismantling the parts, the flakes get relatively easily smashed/torn so the parts are easily dismantled. This is also the reason why, when re-assembling the parts, they should be wiped and a fresh layer of anti seize applied. Low quality mounting pastes (usually cheaper) don’t have enough of these flakes – you are practically paying for and expensive ordinary grease! A good quality mounting paste, properly applied, will provide a long term corrosion protection – lasting for years in all kinds of weather. Carbon fibre bicycle parts, like seatposts, stems, handlebars etc. are very sensitive to over-tightening (worse than aluminium). 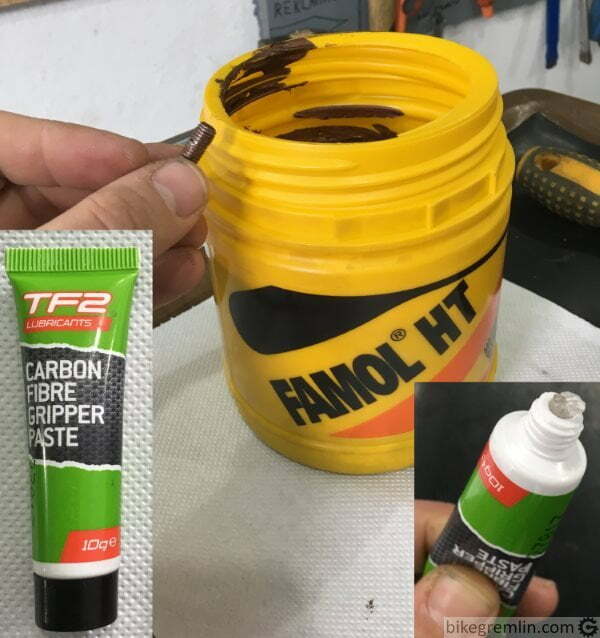 In order to keep them in place, without sliding, using as little tightening bolt torque as possible, carbon mounting paste is used. That is achieved by small parts of silica (silicon dioxide) meshed with a gel-like substance for easy application. Note 1: do not use grease, or any non-carbon mounting paste on carbon parts! It will cause the parts to slip, requiring a lot greater clamping force (which will break carbon parts). Also, once applied, the wrong paste/grease will be very difficult to remove completely from carbon parts. Note 2: do not put carbon assembly paste on stem to steering column interface of threadless stems (not relevant for quill stems). 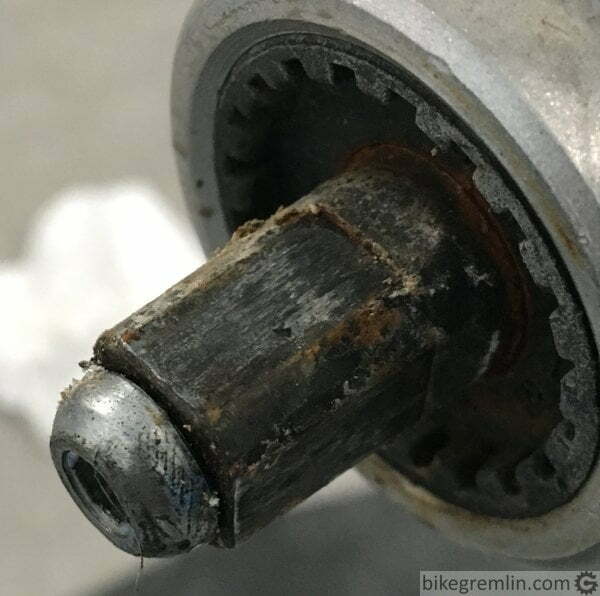 Rough silica particles can, due to vibrations, find their way to the headset bearings and damage them (as it is nicely explained by Mark Killa Barrilleaux in his article and the discussion below). Do put it on stem to handlebars interface though. Also referred to as: “assembly paste”, “assembly compound”, “carbon grease” and various combinations of those. It is usually transparent, with small “grains” that can be felt by hand – like sand mixed with some gel (which it basically is). Manufacturers usually state that it reduces force needed to clamp a part in place by at least 30 %. This should not be mixed with bolt tightening torque (more on this a bit later in this text). Do tighten the bolts to the torque recommended by the part manufacturer. 3. How are they applied? Smear it over the parts using a brush, or a cloth (that doesn’t leave fibres). Or by hand. Mounting pastes should not be mixed with greases, or oils, where those are applied. Likewise, they are not a substitution for grease, where grease is needed (bearings for example). 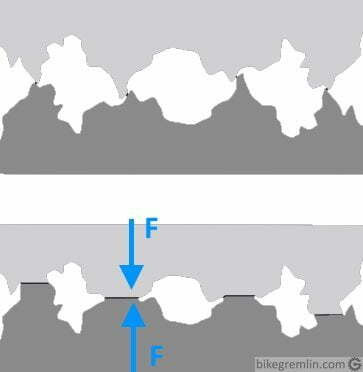 This is important to consider, especially with modern parts: light aluminium, or carbon ones. Manufacturers usually state an optimal tightening torque for parts. Going below, or over that recommendation is not good (without going into details, I’ll just say: too low torque can cause loosening, while too tight can cause plastic deformation). Tightening torques are expressed in “newton metres” (N⋅m). Imperial unit is “pount force foot”, often called “pound-foot” (lbf⋅ft). 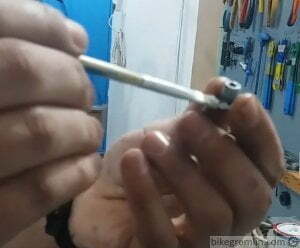 Recommended torques are usually given for a dry fit (in cycling industry at least). That is: surface to surface, without any grease, or mounting paste. If it is not noted otherwise on a torque specification, you can assume that it’s meant as a dry fit torque. When bolts for such specification assemblies are prepared with mounting paste, tightening torque should be reduced by about 20%, since bolts will move more easily and going for the full specified torque might result in parts being damaged from too much compression. If a torque wrench can’t be set to 1/10 of a N⋅m, round to the nearest achievable value (9.5 N⋅m is likely to be achievable with most torque wrenches). This section is dedicated to some myths (misconceptions) about mounting pastes. I’ll consider some of the most common. Mounting paste can lead to bolts loosening? No. If bolts are tightened to a recommended torque, mounting paste will not cause them to loosen. Having said that: some manufacturers make poorly designed interfaces that rely on thread locking compounds (“glue”) to stay in place. These are exception – but these come loose even without mounting paste – “glue” is required. Copper/aluminium/some third kind of paste isn’t good for aluminium/titanium/some third combination of bicycle bolts and parts? It is often that with this statement/question, in a pair, comes a story about galvanic corrosion and metal electrode potentials (nobility). The point is that bicycles take small loads and pressures (compared to cars for example). So it doesn’t take a special mounting paste to handle it – practically any will do. As for galvanic corrosion: it takes water (electrolyte to be precise)! Mounting paste will, if a bolt is properly torqued, prevent water and air from entering, hence preventing the corrosion. I cycle all year round, including winter when roads are often wet and the water is salty, and am yet to have any problems with plain old “copper grease”. 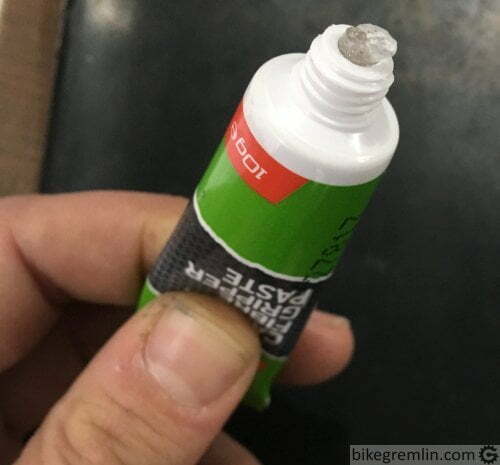 On the other hand, “ordinary grease” doesn’t do the job and prevent parts from seizing together – not after a few months of winter cycling. Since bicycles aren’t subjected to extremely high pressures, or temperatures (compared to industrial machines and motor vehicles), most kinds of anti-seize mounting pastes will do fine – as long as they are of good quality. 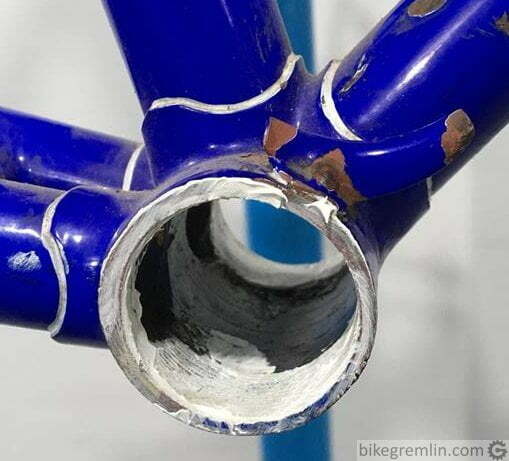 For example, “copper grease” can sustain temperatures of up to 1000 °C, but most bicycle assembly bolts rarely see temps over 100 °C (maybe up to 200 °C for disc brake bolts). The only problem can be a poor quality paste with too little anti-corrosion and anti-seize additives. 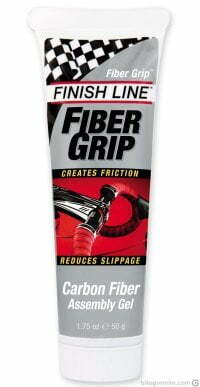 With carbon mounting pastes it is similar: they are mostly made and sold as bicycle carbon part assembly pastes. Can’t go wrong with most of them. Here I’ll list what I’m using and what I can recommend from all the available products. Providing Amazon affiliate links, so I’ll get a commission of any purchase, with the price staying the same for you. Click on an image to shop. Or to see what the product looks like and get it in a local store (auto lubricant stores usually stock these, or similar products). Personally, I use locally made FAMOL PT paste (titanium oxide and kaolin based). It has white colour, so customers don’t complain about “rusted bolts right after service” as they used to occasionally while I was using copper anti seize. 🙂 But that paste is hard to get out of Serbia, no worldwide distribution that I know of – unlike Loctite (which is also good). 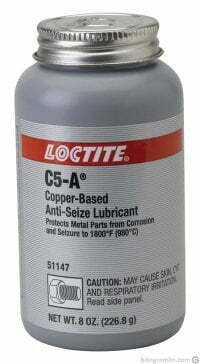 Note: all the copper based anti seize pastes are hard to wipe off and have a characteristic dark colour (including the above recommended Loctite C5-A). On the other hand, FAMOL PT is both white and easy to clean. There are many other white coloured anti seize pastes, but I haven’t tested how easily they are wiped off, nor how well they prevent corrosion, so can’t recommend any, unfortunately.